You’re no interior design pro, but as a woman of discerning tastes, you do know what you like: A little bit of this from the 60s, a little bit of that from the 80s. In a word, eclectic. That, to an overzealous decorator, can be code for “confused mishmash.” But it is totally possible to mix pieces from different time periods without your home looking like a thrift store. How can you be sure that the 70s-inspired rug you grabbed at a flea market will look OK with the 50s-style side table your grandparents left you, and that it will all go with the contemporary stuff you bought at your local big-box store? We spoke to Orlando Soria, West Coast creative director at Homepolish, for top tips on mixing genres. The main takeaway? Don’t buy blindly — really think about color and about how each new potential piece will go with what you already own. More specific tips (and great genre-mixing duos to inspire) ahead. 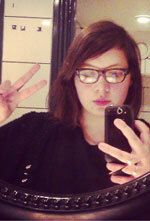 Alison Baitz is a freelance fashion and culture writer. When she's not busy chatting about online shopping or rooting out cool new designers, she's interviewing up-and-coming musicians or sampling food for articles and calling it research. She's proud to be a part of the DC-based food zine The Runcible Spoon. Yes, she is on Twitter: @itsmealison.